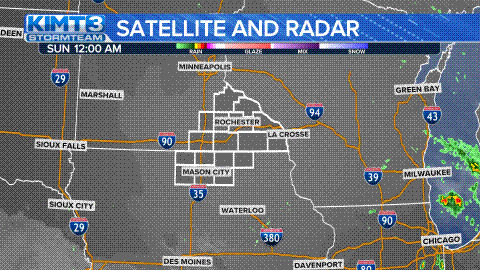 weather-live-3 weather-live-2 north iowa tonight: clear. lows: near 30. winds: northwest at 6 to 12 mph. tuesday: sunny. highs: upper 40's to near 50. winds: north northwest at 5 to 10 mph. tuesday night: clear. lows: upper 20's. winds: light and variable. southern minnesota tonight: clear. lows: lower 30s. winds: northwest at 5 to 10 mph. tuesday: sunny. highs: middle 40s. winds: northwest at 5 to 10 mph. tuesday night: clear. lows: lower 30s. winds: north at 5 mph becoming light and variable. weather-main-6 weather-main-5 it doesn't get much better than today for late october, hopefully you enjoyed the warmer temperatures and sunshine. if not, don't worry because the sun will stick around for tuesday and most of wednesday but temperatures will be a bit cooler, in the low 50's. nighttime temperatures will drop to near 30 or below thanks to the clear skies. rain chances return thursday with cloud cover keeping highs in the 40's. the models currently disagree on timing, but various rain chances will linger for friday and the weekend, though the rain looks to stay light and intermittent. temperatures remain cool, in the upper 40's and low 50's into next week. tonight: clear. lows: near 30. winds: northwest at 6 to 12 mph. tuesday: sunny. highs: upper 40's to near 50. winds: north northwest at 5 to 10 mph. tuesday night: clear. lows: upper 20's. winds: light and variable.